Libary: You can now edit flag, rating or read/unread metadata for a paper directly from the library list table. Reader: Quickly find a paper in your library by clicking "Reveal" in the Overview inspector - you are brought back to the Libary tab and the paper will be automatically selected in the library list table. Citations: New look and feel. Highlighting: The choice of current highlight annotation color is now remembered between app launches when adding subsequent highlights. 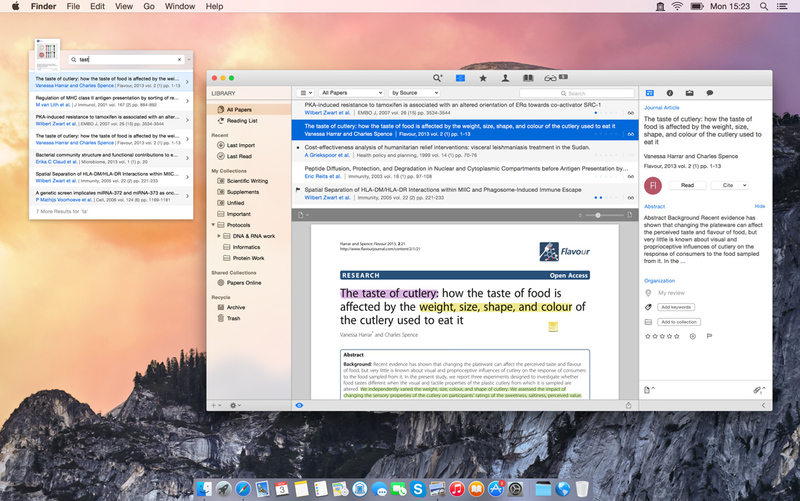 Look & Feel: New icons and images as part of the refreshed look of Papers 3 for Mac for OS X 10.10 Yosemite. Supplemental files are now correctly imported and exported with Papers Archive files. Fixes an occasional crash at launch when running on versions of Mac OS X older than 10.9. Author metadata is now added to the Info inspector when importing BibTeX, Endnote or RIS files. Color labels, flag status and ratings are now persisted when moving papers to a Papers Online shared collection or the Reading List. The subtitle field in the Info inspector now wraps text onto a new line when changing the wide of the sidebar panel. When selecting the same paper in different collections simulatenously, the status message in the bottom bar is now updated correctly. PDF Display menu items are again available from the View menu.